I write this specifically for acne prone skin. I've been applying benzoyl peroxide for the past one year and I never moisturized because my skin is already oily. But benzoyl peroxide (BP) dried my skin out badly. 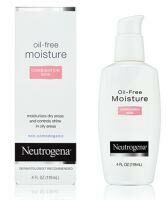 I had bought this moisturizer ages ago when I saw it displayed on a shelf in a store and the SA told me it wouldnt clog pores. Even with the BP, I used to get tiny bumps and pimples. But after I started using this my face is free of pimples and bumps and this hasn't happened in years! I guess my skin was lacking moisture so it was overcompensating for it by producing more sebum which in turn led to clogged pores. For anyone who is going through the same problem as me: I apply a tiny amount of BP after cleansing my face. I wait for 5 minutes before I apply this moisturizer. Then I might or might not wear makeup on top. Hope this helps!